Individual membership in CAMWS for the fiscal year July 1 through June 30 may be purchased for $65 ($30 for student, retiree, first-time teacher, or new CAMWS member; $45 for contingent faculty). Joint spouse/partner membership is available for $90, retired spouse/partner membership for $50 Llife memberships are also available for individual or for joint spouse/partner. A membership includes a one-year subscription to The Classical Journal as well as on-line access to the Loeb Classical Library. Please indicate on the membership form whether you would prefer to receive CJ electronically (via JSTOR) or in print. For an extra $5 you may receive the journal in both formats. Please note that membership in CAMWS provides electronic subscription only to the current volume of CJ. CAMWS members wishing to have access to back issues of the journal can do so at a special rate through JStor. Please contact Tom Sienkewicz at stcamws@camws.org for additional information. The CAMWS Newsletter is sent electronically to all members with e-mail addresses. If you would like to receive a print version in addition, you may indicate that on the membership form. 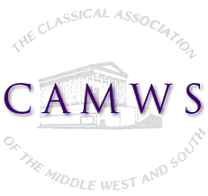 As part of your CAMWS membership, you are automatically subscribed to Classical Journal On-Line from which you will received frequent reviews of new books in the classical field, unless you indicate on the membership form that you opt out of this subscription. Membership in CAMWS also includes on-line access to the Loeb Classical Library. (Please note that it may take two or more weeks following payment to process this on-line access.) CAMWS members can also request a complimentary subscription to Greek Keys. Individual membership in CAMWS makes one eligible to submit an abstract for a CAMWS meeting and to apply for various CAMWS awards and scholarships. Please note: Individual memberships or subscriptions to CJ sent to an address outside the United States or Canada are subject to a $20 postage surcharge. Individual subscriptions automatically include membership in CAMWS. You may use the CAMWS membership form to join ACL or SALVI, subscribe to any of eight other scholarly journals, order a copy of Herbert Benario's CAMWS: A History of the First Eighty Years, purchase various CAMWS merchandise (including 6-inch ‘Roman’ rulers, a CAMWS YoYo, shot glasses or koozies) and/or make a tax-deductible contribution to CAMWS. An individual must be a current member of CAMWS in order to 1.) submit panel, workshop or individual paper proposals for the annual meeting, 2.) register for the annual meeting; 3.) apply for any CAMWS awards or scholarships, including CPL awards; or 4.) hold a CAMWS office or serve on a CAMWS committee. If you are already a CAMWS member and wish to order CAMWS memorabilia or subscribe to other journals, please use this Miscellaneous Order Form. All questions concerning memberships should be directed to Jevanie Gillen, CAMWS Administrative Assistant at Monmouth College (e-mail: jgillen@camws.org; phone 309-457-2284). Thank you!